Thu., Sept. 21, 2017, 5:08 p.m.
Matt Linehan’s ascent of the University of Idaho passing records – he overtook Ken Hobart for fourth in career yards last week – has been the dominant theme of the Vandals’ offense this season. But it’s not the only storyline in the book. Idaho has been able to advance the ball from the backfield productively and often dramatically. Aaron Duckworth is fashioning a senior season that will have his grandchildren rolling their eyes in disbelief when he recounts it from his rocking chair. But it’s all true, and junior Isaiah Saunders, a hero of the Famous Idaho Potato Bowl last December with 147 yards rushing and three touchdowns, is continuing his authoritative running this year. The Vandals are 1-2, with one clunker against UNLV, 44-16, and one that got away in the fourth quarter against Western Michigan, 37-28. Idaho is looking to even its record in the Sun Belt Conference opener against South Alabama on the road Saturday. Duckworth and Saunders could play a big role in accomplishing that. In the first three games, they are setting a pace that invites a nickname for the duo, like the Pony Express, RPMs or Mr. Inside and Mr. Outside, even though they play in a rotation rather than together. Duckworth has rushed 50 times for 321 yards, 6.42 yards per carry. He has caught five passes for 145 yards and is making an art form of the short reception and run, highlighted by a 60-yard dash against Western Michigan. Saunders is right behind him with 32 carries for 170 yards, a 5.3 yards per carry average. Enough people have mentioned Thunder and Lightning as a nickname that Saunders brings it up in conversation, although it kind of shortchanges him. Duckworth is indeed lightning, a breathtaking flash suddenly materializing on the corner then streaking through opposing secondaries. However, Saunders does not merely rumble up to the line and lean forward. He squares up with low pads and hits holes so quickly at 225 pounds his first contact with a defense calls to mind splitting an atom, a violent discharge of immense energy. Where Duckworth makes defenders question their ability to get a hand on him, Saunders tests their will. “That’s what Isaiah does best, running through tackles, being a physical guy,” Vandals running backs coach Jason Shumaker said. Duckworth and Saunders don’t benefit from the senior-laden offensive line they had a year ago. But the one senior in this year’s group, tackle Jordan Rose, said last spring the line sets a standard for itself as a physically imposing group of run blockers. Pass blocking has sometimes been questionable this season, but Rose has been right about the run blocking. A senior, like Linehan, Duckworth is reaping the benefit of experience. Duckworth found his way to Idaho from Orange Park, FL. Saunders hails from the other coast, Elk Grove, California. 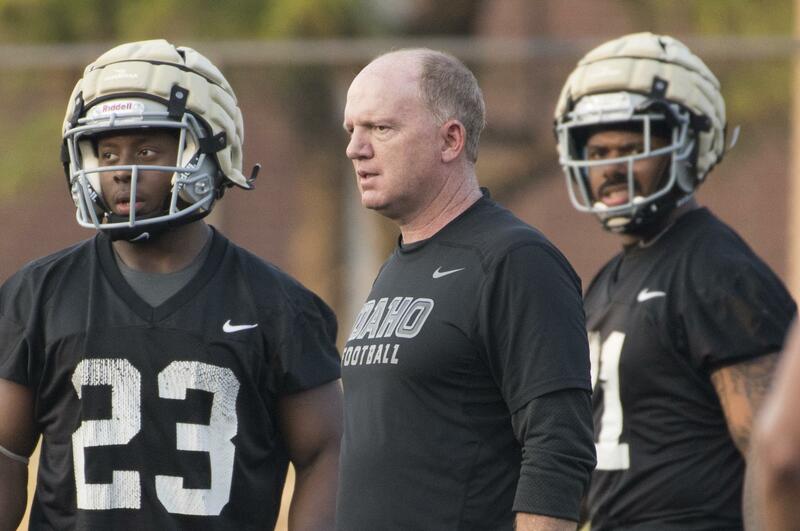 His father, Walt Saunders, played at Idaho in the early 1990s when current Vandals head coach Paul Petrino was his position coach. The father impressed upon his son how much he enjoyed his time in Moscow. “It didn’t take long for me in high school to commit here,” Saunders says. “He was so happy. Both Duckworth and Saunders can carry the load at running back, according to Shumaker. Who plays when is some ever-shifting amalgam of trying to set up a defense, intuition and who has the hot hand at the moment, Shumaker acknowledges. But overall, he’s got a lot to work with. “They’re older. They understand the scheme.” Coaching them now “is more in detail about what block to expect on every play. It’s not just the big picture stuff anymore,” he says. Duckworth promises their expanding role will always include the make-you-gasp highlights he has contributed the first three games. Published: Sept. 21, 2017, 5:08 p.m.